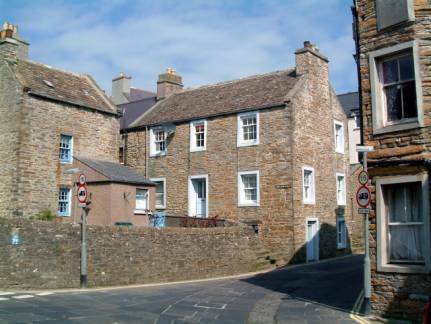 This is a fine sandstone built classic Stromness House, built c. 1786 in the heyday of the Hudson Bay Co, with original Caithness Slab roof. Now well refurbished, insulated, double-glazed. 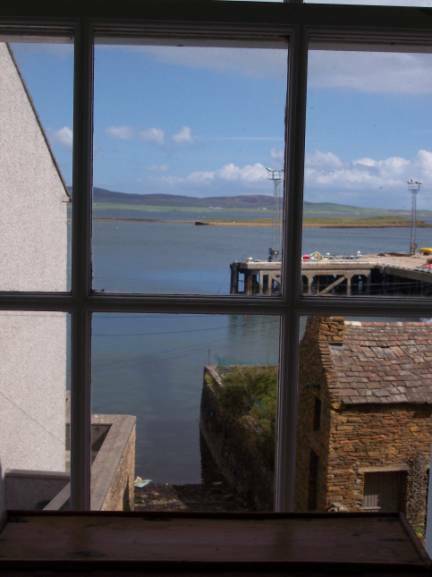 3 bedrooms: 1 master with windows looking down over the tidal Holms islands and Scapa Flow, en suite shower and bath; 2 good sized bedrooms with shelving and desks etc for use as writing studies. Kitchen-diningroom; good sized sittingroom with Scapa Flow outlook. There is a fine walled garden up the passageway, which even has a fine 200 year old tree! It is very sheltered and fairly wild, with a lot of fuschia and wild roses. Great place to sit and read in. Current tenants in till end Feb.
We are moving to a smaller house out of Stromness. 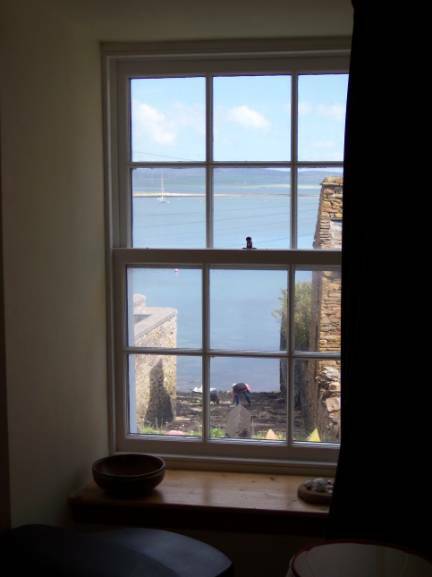 This has been a wonderful house for us, and we and various writing tenants found it a great place to live and write, with good, interesting people around, and plenty of solitary walking by the sea. And sailing. And notable free wild brown trout fishing in the inland lochs. And a very enjoyable cheap 18 hole golf course with stunning outlooks across the Sound to Hoy. And good musicians with broad tastes. Life doesn’t get much better. The main Orkney ferry comes into Stromness, c. 10 mins walk from the house. It is the way Scotland looks to the South. or flick the kettle’s switch and wait.